Today's recipe is dedicated to those who are refining the last details of their Epiphany menu. Last week, we announced the winners of the Elbullirdeagus blog contest and suggested one of them as a festive canape for New Year's Eve. 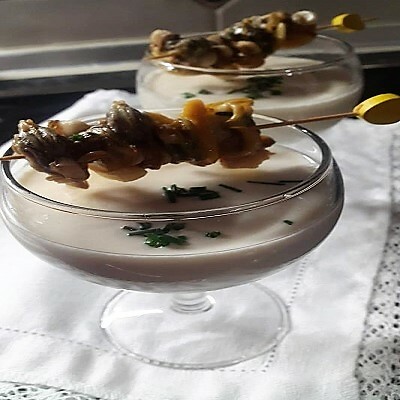 Today, we close the Christmas season (outside our contest) with the second one, the perfect starter to a delicious Epiphany meal: Arantxa’s asparagus soup with cockles brochette. Crush the asparagus with the water of the cockles, the mayonnaise, salt and pepper to taste, and a dash of oil. Place in glasses and sprinkle some chive on top. 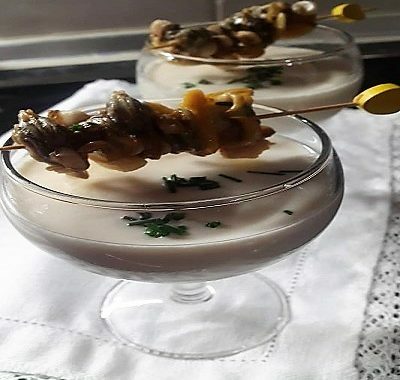 Form some brochettes with the cockles and place them on top of the glasses. * Recipe presented by Arantxa Casillas at the “Cocina con Conservas de Pescado 2018” contest on the elbullirdeagus.com website and the elbullirdeagus.com Facebook cooking group sponsored by Conservas Serrats. If you like this recipe, you can make it at home with the cockles available in our online store.